*Exclusively for Jio SIM Users* Your on-demand video streaming platform with over 1 lakh+ hours of exciting content: Movies, TV Shows, Music videos, Clips, Trailers & more. 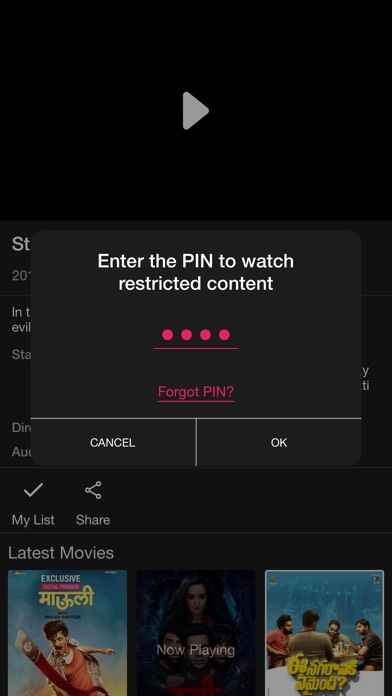 Binge watch movies, episodes of your favorite shows, music videos, interesting short clips and more on your iOS device. Enjoy and browse through Hindi, English, Tamil, Kannada, Marathi, Telugu, Bengali, Gujarati, Bhojpuri, Malayalam, Punjabi & dubbed content. Exclusive Disney section Unlock the World of Disney and share the joy with your friends. This section is just tailor made for The Kid in you. 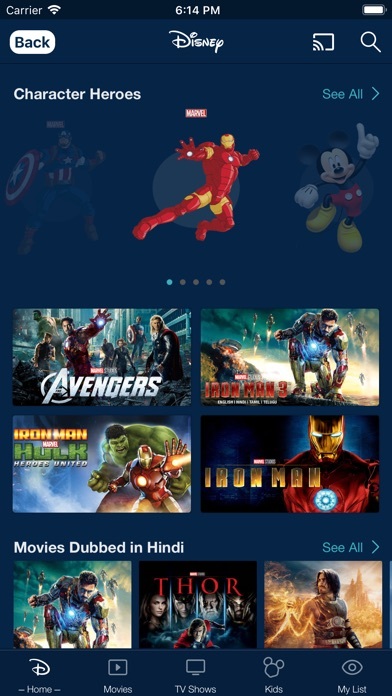 Get the best of Disney movies, TV shows & your favorite super heroes from the MARVEL universe & much more. Discover all the movies and videos of your favorite character in just one click. To personalize it to the next level, this comes with a freedom to choose your preferred audio language. Go check out the super awesome movies like the Iron Man series, Star Wars, Avengers, Lion King, Cars 2,Toy Story series, The Jungle Book and the list goes on and on. 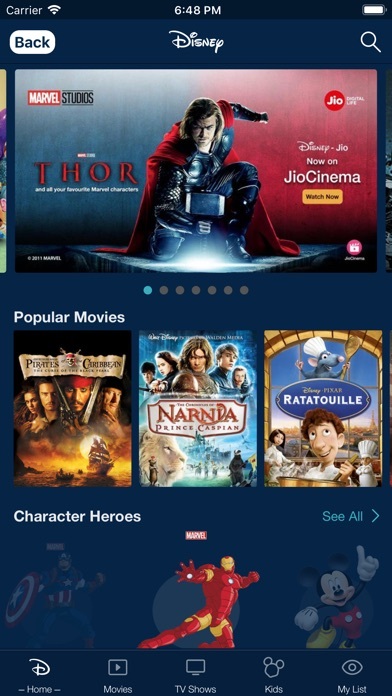 For the love of Movies JioCinema offers a vast library of movies across genres (romance, animation, action, comedy, thriller, drama, documentaries, etc) to choose from. Latest additions to our library include: Andhadhun, Baazaar, Manto, Stree, Manmarziyaan, Happy Phirr Bhag Jayegi, Pihu, Force 2, Rangoon, Shubh Mangal Saavdhan, Kabali Bajirao Mastani, Bajrangi Bhaijaan, Dishoom, Housefull 3,Ki & Ka,Happy Bhaag Jayegi, C/O Kancharapalam & more. Watch the best of Paramount movies like: Catch Me If You Can, Forrest Gump, Mission Impossible, Mission Impossible Ghost Protocol, Munich, Transformers (also available in Marathi, Bengali, Tamil, Telugu) & more. Binge Watch TV Shows & Originals We bring to you a wide array of latest popular TV Shows from the house of Colors, Zee, Sony & more. Patiala Babes, Ladies Special, Tantra, Naagin 3, Dastaan-E-Mohabbat Salim Anarkali, Spiltsvilla 11, Silsila, Khatron Ke Khiladi, Mere Sai, Mahakali, Tu Aashiqui, Shani, Crime Patrol, Taarak Mehta ka Ooltah Chashma .Binge watch latest original series like Broken, The Investigation, Apharan, Smoke, Zindabaad, Side Hero, The Great Indian Dysfunctional Family, Bose - Dead or Alive, Haq Se etc. Now you can also watch TV shows in your preferred language. Let the Music Play We have the best of music videos from finest artists across the world like AR Rahman,Beyonce, KK, Sia, Vishal Shekhar, Coldplay, Pritam, Pitbull, Amit Trivedi, Badshah and musical shows like MTV Unplugged Seasons. JioKids Section Let the little ones enjoy the widest range of cartoon movies with a dedicated JioKids section. It is secured by a parental lock to ensure a safe experience for the kids. JioCinema Features - Exclusive Disney Section - Dedicated Originals Section - Chromecast support to watch your favourite movies, shows on TV - Choose your preferred audio language for video viewing - Choose your preferred subtitle language for video viewing - Resume watching from where you left off across any compatible device - Choose the quality at which you want the video to be played - Get entertained without any advertisement pop-ups - Watch movies and browse the app simultaneously – by just dragging and docking the player. - Share functionality - Available on web: www.jiocinema.com Follow us: Facebook: https://www.facebook.com/JioCinema/ Twitter: https://twitter.com/JioCinema YouTube: https://www.youtube.com/channel/UC8To9CFsZzvPafxMLzS08iA Instagram: https://www.instagram.com/officialjiocinema/ Reach out to us at jiocinema@jio.com for any queries, feedback or in need of assistance.